BeoLab 1700 type 2605 was an amplifier designed to be used with Beomaster 1700 tuner.
" This title and the picture of Beosystem 1700 might suggest a paradox to many readers. And in a way you are right. But there is a reason why Bang & Olufsen has separated this otherwise perfectly integrated high-fidelity system. The combination possibilities in Beosystem 1700 are so numerous that for many people the entire system is unnecessary. The essential part of the system is BeoLab 1700: a 2 x 20 watts RMS amplifier with ambiophonic stereo facilities. The tuner, Beomaster 1700, the cassette-recorder, Beocord 1700 and the record player, Beogram 2000 (not shown) cover nearly all existing programme sources for the reproduction of music. Beovox 2702 loudspeakers complete the system. Beovox 1702 are recommended as side speakers for ambiophony, if this extra sound experience is desired. Now it is up to you to put your ideal Beosystem 1700 together. " 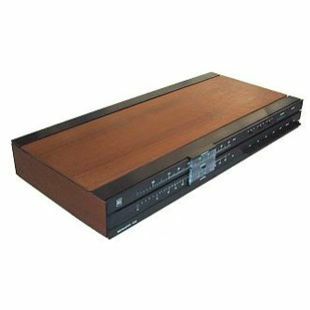 The unit was a high-fidelity stereo amplifier whose technical specifications exceeded the DIN 45500 high fidelity norms by a wide margin. Frequency range was 20-30.000 Hz and power bandwidth was 10-50.000 Hz. Harmonic distortion was less than 0.1% at the normally used output (50 mW) and less than 0,5% at maximum power output (2 x 20 watts RMS). Music output was 80 watts total. With four loudspeakers - two front and two at the sides, ambiophony (an extension of stereo reproduction) could be achieved. Apart from loudspeaker connections, there were sockets for tuner, tape recorder, record player and headphones. BeoLab 1700 had slider controls for volume, bass, treble and balance. A push button for LOUDNESS facilitated switching between an objective and a subjective linear reproduction. Monitoring (AB switching) could be carried out on BeoLab 1700 if the connected tape recorder had separate record and play-back heads.